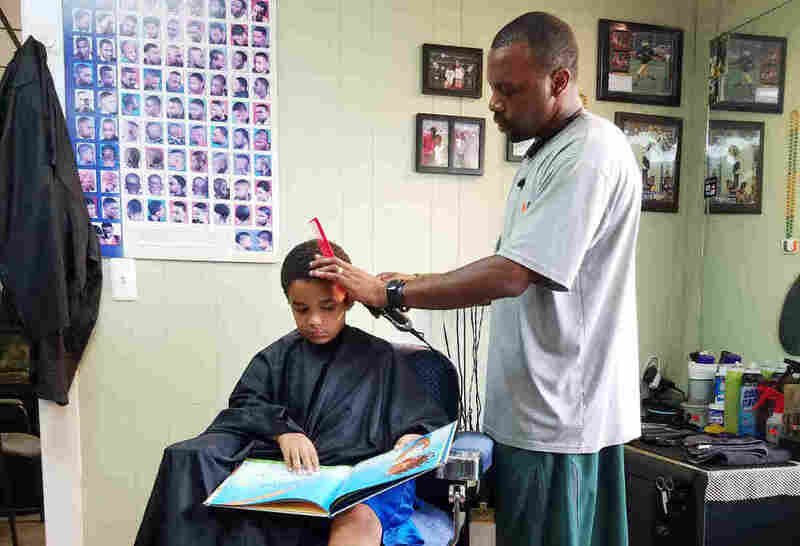 Choose A Book And Read To Your Barber, He'll Take A Little Money Off The Top : NPR Ed A great way for kids to brush up on reading skills? Why, reading to the barber, of course. That's the idea at one barbershop in Ypsilanti, Mich. Oh, and in Houston, Dubuque, Iowa, and Columbus, Ohio. Jozef Jason, 7, reads a book to Ryan Griffin at the Fuller Cut in Ypsilanti, Mich., as part of the barbershop's literacy program. You know, maybe someday some kid will grow up and be a journalist, be a writer, and he'll say, 'You know what, when I was young, my barber used to make me read.' "
Ryan Griffin, barber, Ypsilanti, Mich.
"It's an amazing thing," Jason says. "It's helping my pockets, it's helping their education, and it's helping prepare a better future for them, so I love it." This program made its way to Ypsilanti because of Ryan Griffin, who has been cutting mohawks, fades and tapers here for 20 years. He says he first read about a similar literacy program in Harlem, N.Y., so he asked his boss if they could replicate it. Within a few weeks, people in the area were donating books to the cause. "We get complimented by teachers that will say it does so much for these kids throughout the school year," he says. You can find similar programs all over the country, from Houston, to Dubuque, Iowa, to Columbus, Ohio. But here at the Fuller Cut, it's not just enough to read the book out loud. Kids, Griffin explains, get quizzed by their barber to make sure they understand what they read. "Any help these kids can get with reading and ... comprehension is a big thing. You know, maybe someday some kid will grow up and be a journalist, be a writer, and he'll say, 'You know what, when I was young, my barber used to make me read.' "
Jozef picks We're Going on a Lion Hunt from a stack of books piled on top of two green tables in the waiting room. "We're going on a lion hunt," he reads. "We're going to catch a big one. We're not scared, been there before." Meanwhile, Keith Jason encourages his younger son, Joziah, to pick a book while they wait for his turn. "Hey, Bud, pick out a book that's gonna challenge you, nothing too easy. All right?" A lot of young black boys come to the Fuller Cut to get a trim, and the shop tries to reflect that in its book selection. Books about black baseball players and black kid detectives make up a lot of the titles. 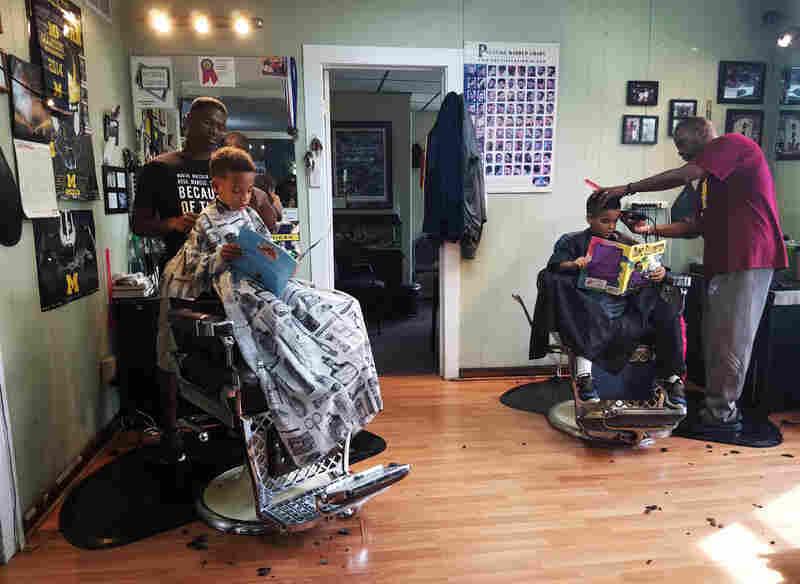 More than a hundred kids have read to the Ypsilanti barbers over the past year. Some more willingly than others. Georgio Pitts, 9, is going into fifth grade this year. He doesn't seem super enthusiastic about reading. His dad says Georgio would rather play video games, but he makes his son grab a book all the same. His pick? Home Run Kings. He may not love the reading part, but the part where he gets $2 from the barber to put in his piggy bank? That part is pretty great.